Linfield's Irish Cup tie against Warrenpoint Town is to be played on Saturday as originally planned. The sixth round match had been put back to 16 February to allow the Irish FA to investigate if Warrenpoint had fielded an ineligible player in the last round. But on Thursday they announced striker Darren Forsyth had been OK to play in the 3-1 fifth round win at Coleraine. The clubs then asked the cup committee if they could revert to this Saturday and that was approved. It means all eight last 16 ties will be played on Saturday. The probe into Forsyth's eligibility focused on whether his transfer from Glenavon had broken Fifa rules because Warrenpoint were alleged to be his third club this season. Under the Fifa regulations a player can only appear for two teams in a season. Portadown have announced the signing of former Shamrock Rovers defender Ken Oman on an 18-month contract. Oman, 32, also had a spell with Derry City and was most recently with Dublin club St Patrick's Athletic. However, Forsyth played for a team in the Republic of Ireland, and Fifa's definition of a season relates to the top division in any given country. In the Republic, top-flight fixtures run from March to October. A statement released by the IFA on Thursday explained that they had "carried out a thorough investigation" and considered "all relevant rules" before reaching their conclusion. Coleraine would have been reinstated if Town had been expelled from the competition. 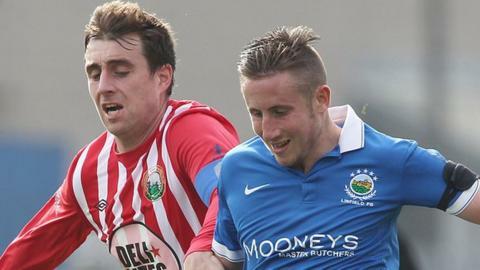 If found guilty of breaching rules, the Milltown club would also have been deducted five points accumulated from Premiership games in which Forsyth featured, against Ballinamallard United, Cliftonville and Glenavon, and fined £600. This sanction now appears very unlikely, although the Northern Ireland Football League has yet to confirm this. He was involved as a substitute in Warrenpoint's victory at Coleraine in the fifth round of the Irish Cup. In August, Forsyth had played for Greystones AFC, an amateur club, based just south of Dublin, who play in the Leinster Senior Football League.